Taken in 1959 You are currently viewing a site that concentrates on trolleybus systems that have long since disappeared from the UK urban landscape, with historically interesting pictures and background notes to enable memories to be stirred. as passenger number . I regret that I can't offer you a cup of tea, but there are plenty of mouth watering pictures for you to enjoy. There's a simple navigation bar at the side to find your way around the site, just click on the red button against your choice. If the navigation panel is not present simply click on the 'Welcome Mat' to bring it into view. This site can take several hours to view all the current material. You will probably want to continually return to this site, so please considering adding this site to your 'Favorites' list. Croydon's Trolleybuses were Routes 630 and 654, with a common piece of overhead wiring along Tamworth Road into Station Road, West Croydon. The trolleybus replaced former tram routes in the mid 1930's but were themselves ousted by the diesel bus in two stages, March 1959 and July 1960. Another nearby route was 612, terminating at Mitcham Fair Green, but this ceased way back in 1950. Before disappearing into obscurity, a small photographic record was captured by me, and is presented on this site. The pictures highlight the considerable changes that have taken place in the Croydon area in four decades, not least of which, has been the added congestion on the roads. In 1959, a three mile bus ride through Croydon took around 20 minutes, today it is nearly an hour! It is this congestion that sees the return of the tramcar in an attempt to provide acceptable journey times. Once more, trams trundle along Tamworth Road, and other parts of Croydon, although they seldom mix with other road traffic in their travels. Other trolleybus pictures can be found using the green index panel on the left. You can take a trolleybus ride around Kingston [Routes 601-5], Isleworth [Routes 657 & 667], Ilford [Routes 691 & 693] and the isolated outpost of Woolwich [Routes 696 & 698]. If that is not enough 'wire wiping' for you, there are other picture galleries to inspect, articles to read and modeling sites to visit. A few tram pictures are presented simply because I was there at the time. Photographic content comes mainly from original material of which I am the copyright owner. Additional pictures and drawings have been supplied by other trolleybus enthusiasts or organizations and are reproduced with their permission. Deep hyper linking to pictures on other WEB sites has been used, but it is with the full knowledge, and co-operation, of each copyright owner. A small amount of material used here has proved impossible to determine the present owner, so if you recognize your work please let me know. All images, photographs and video contained in this site are © Copyright 2007 David Bradley, unless otherwise stated. All rights reserved. To request permission to re-post or publish material located on this website, you must email me. No request is unreasonably withheld and seldom is payment requested. The camera used by me some forty years ago was a Minolta A5 35mm SLR camera which had a Rokkor Lens 1:28 with f=45mm. Pictures were generally taken with a lens hood in place. It was purchased in 1959 for £35 and served me very well for 30 years before being replaced. I recently re-discovered the camera and could not believe its weight! Slides were made into digital images using a CanoScan Fs2710 scanner and then brought into PhotoShop for final editing. Web pages on this site were created by simply using Notepad and these files together with images were uploaded to my web space using WSFTP Pro. Currently there are around 500 pages to view which, with the images, requires a hosting package of 700Mb. Every page on the site should be complete and fully functional, but errors and mistakes do happen. If you discover anything that is wrong, or you have a contribution to make, please do not hesitate to me. I welcome your input. A Guest Book facility is available and accessed from the green navigation panel to the left. This site is pure nostalgia for the trolleybuses that once ran in many towns and cities throughout the UK until the early 1970s. They have, however, been retained, modernized and networks expanded throughout Europe and with the environment firmly on the agenda, now is the time to re-introduce these vehicles back into the UK. Unfortunately transport planners seem to be fixated on alternative fuel sources for buses or unrealistically turn to light rail as a solution to solve all problems. 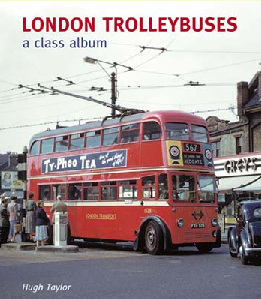 London Trolleybuses - a class album by Hugh Taylor was released by Capital Transport. This hardback book, is priced at £18.95 and contains 113 colour photographs all of which have informative captions. The text deals with each class individually and summarizes their movements around the system; 'odd' allocations such as 794B working on route 667 and 1478 working at Stamford Hill depot are detailed giving the reader an insight into some of the lesser known movements of the London trolleybus. Virtually the whole system is covered and is a book that every trolleybus enthusiast should own. Over twenty pictures from this web site are included in this book which has had excellent reviews in monthly bus publications. It can be purchased online from www.capitaltransport.com. When ordering this book please mention that you saw it advertised on David Bradley Online. These two soft backed books are crammed full of monochrome pictures, with a few in colour, of trolleybuses operating in specific areas. 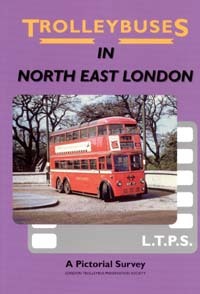 Trolleybuses in North East London covers in 144 pages the NE corner of London comprising of Woodford, Chingford, Leyton and Hackney. 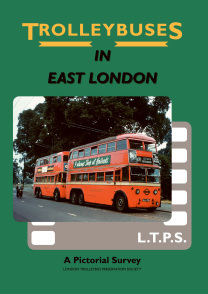 In the 128 pages of Trolleybuses in East London, the reader is taken on a magical tour of Bow, Stratford, Ilford, Barkingside, Chadwell Heath, Barking, East Ham, Canning Town and Stratford. Each book reminds us just how extensive the trolleybus network was in London and each has a pull out drawing of the overhead wiring for the routes covered in the book. Many of the picture locations featured have changed dramatically, and not necessarily for the better; retail establishments that were expected to last for ever are now long gone and much of the street furniture of the period has been replaced with a forest of traffic management controls bordering on urban pollution. It is expected that each book will be picked up time and time again to remind the reader of perhaps better times some 50 years previously. There is now limited availabity of these publications so please enquire if your order could be satisfied by emailing ltps@trolleybus.net first. If you could also mention that your enquiry was inspired by this web site, that would be appreciated.